Pie Face's new Broadway storefront. MIDTOWN — David Letterman will soon have some new pie to throw in guests’ faces. Australian favorite Pie Face is planning to open its first U.S. bakery in Midtown next month, serving sweet and savory pies next to Letterman’s iconic Ed Sullivan Theater on Broadway at the corner of West 53rd Street. “Everybody’s excited,” said construction manager Dan Cochran, noting that the store is part of a larger Pie Face expansion across the U.S. The new location is part of a big turnover on the block, which will also soon be home to the city’s highly-anticipated first Steak ‘n Shake, the beloved Midwestern burger chain. Pie Face will try to turn New Yorkers onto traditional meat pies. Flavors will include chunky steak, chicken and mushroom, pork and apple, tandoori vegetable, and bacon, egg and cheese, each of which will feature a different playful facial expressions encrusted on its pastry. The shop will also offer sweet varieties including lemon, chocolate and apple. The pies will come in two sizes: a regular, meal-size for $5.95 for a savory, and mini, which will sell for $3.25 for sweet pies. In addition to the traditional pies, the bakery will also sell high-quality coffee, served in cheekily-named blends like the bold cup of “Kick My Arse,” the milder “Start My Heart,” the mild “Open My Eyes” and the decaf “Still Asleep." Specialties will include “long blacks” (think Americano) and “flat whites” (served with steamed milk) as a testament to what Yorio described as Australia's near-Italian obsession with coffee. “Australians are absolutely insane about coffee,” she said, adding that the brand hopes to open a handful of stores in the city over the coming year, with the next scheduled for this coming spring. The take-out spot will also include a full café with rotating pastries and cookies, wraps and soups. 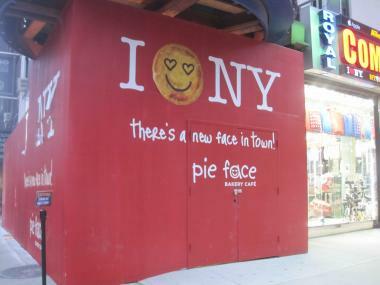 Pie Face is set to open its first New York location on Thurs., Dec. 15th at the corner of Broadway and West 53rd Street.